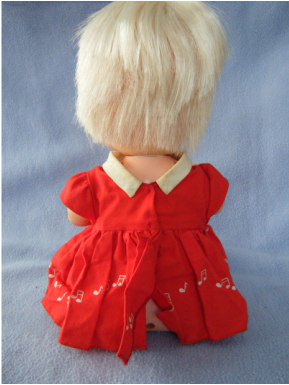 Baby Grow-A-Tooth is a Remco doll first produced in 1968. We've nicknamed this doll "Matilda" as she has a Christmas story like the one in "Santa Claus and the Little Lost Kitten" by Louise W. Myers (published in 1952). My sister purchased her on eBay in early December with Priority Mail delivery. After being logged into the tracking system at the seller's post office, the package containing the doll disappeared. The seller, buyer, and post office all tried to locate her. She eventually was found and delivered just before Christmas - to the relief of all parties. 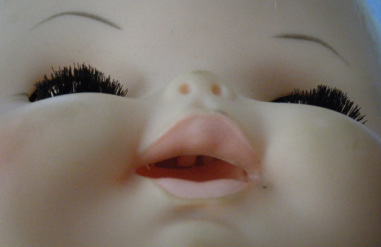 This doll has two functions: she has a pacifier and spoon that cause a spring-loaded tooth to appear/disappear when inserted into her mouth in sequence. The other function is that she sits up in her crib to touch some rattles suspended at the foot of her crib when the switch on the crib is activated. This is accomplished by having magnets in the crib that hold the doll's feet in place while current is passed into and out of the doll through the heel contacts, driving her internal electro-mechanical works. Quite a creative bit of engineering. 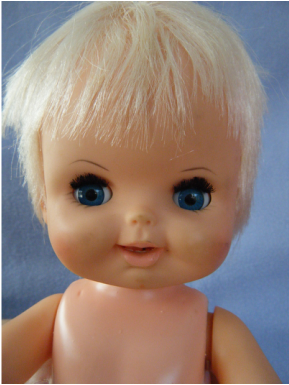 Remco later released another doll called "Baby Sister Grow-A-Tooth" that lacked the crib and the ability to sit up. Baby Sister came with a pacifier, spoon, and a magic bottle. I wonder if the change was because Baby Sister would be cheaper to manufacture and would not require batteries. 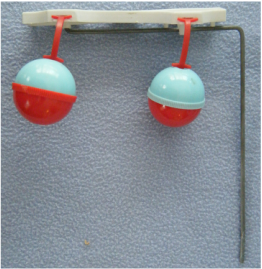 I also wonder if children were inadvertently shorting out the batteries when metal objects fell across the electrical contacts in the crib. We had to try this out! Unfortunately, nothing happened when we powered her up. It was my job to open her up and see what was going on. We hoped it was only the usual seized up motor. This was not the case. 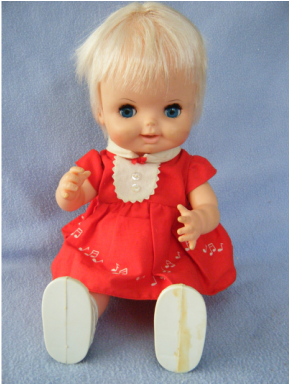 She had a stripped gear - which means that she is essentially unrepairable unless we can find a replacement gear in another Baby Grow-A-Tooth or other Remco product. Top view of the crib. The detail in the bedding is amazing - stitches and wrinkles are molded into the plastic. 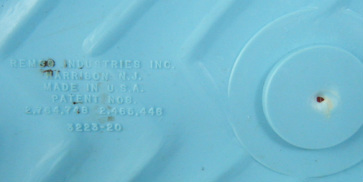 The decal in the center covers an indentation connected with the molding process. The two sets of two gray lines (within indentations) are where the doll's heels make electrical contact (the feet are held in place by magnets). The hole toward the top left of the picture is where the rattle system's arm would mount. 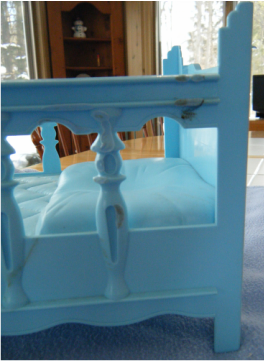 The crib has mysterious melt marks - one of which looked to have black doll hair embedded in it. Although we will never know the actual cause, it seems likely that the crib was placed too near a radiator in a child's bedroom. 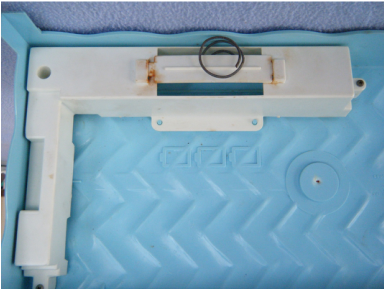 Close-up of the electrical contacts for carrying current from the batteries in the bottom of the crib to the doll's electric motor. The doll would have no power source when removed from the crib. 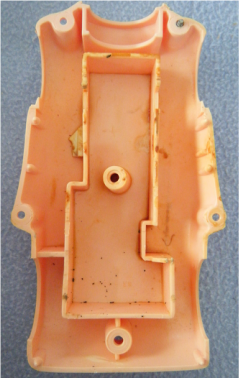 The battery cover shows evidence of battery corrosion. The crib powers the doll using 3 D batteries. The snap in plastic cover is a little brittle. The black coil is the spring that would hold the batteries in compression (if it was in the correct place and not sitting loose). 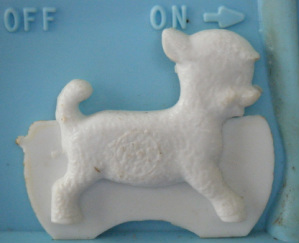 The On/Off switch is disguised as a little lamb. It always helpful when the manufacturer includes the patent numbers on the product - it saves a lot of searching on Google Patents. The underside of the foot of the crib. The magnets and electrical connections were visible once the white housing was removed. 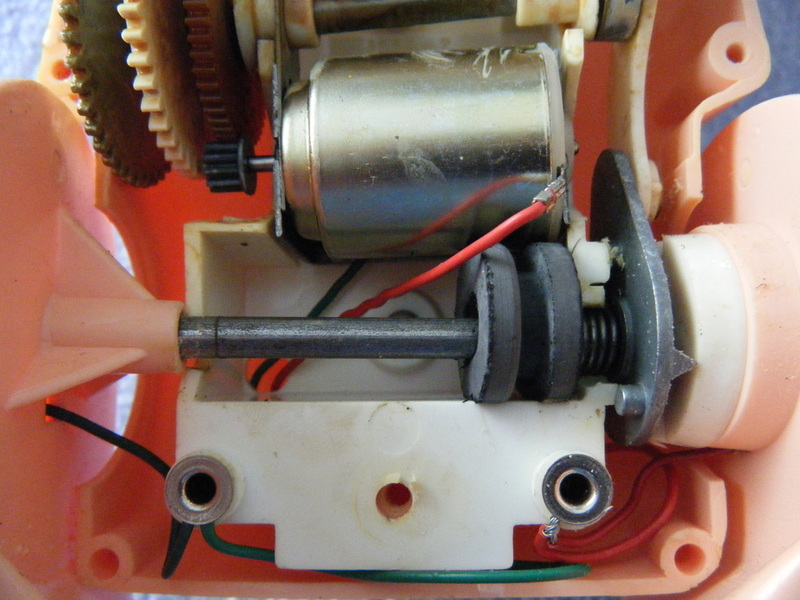 The battery contacts are visible once the white plastic housing was removed. The contact are in good condition despite the corrosion marks that were evident on the plastic cover. This is Baby Grow-A-Tooth in her seated position (as if she was going to play with the rattle mobile). The side view reveals some of the detail in the molded shoes. 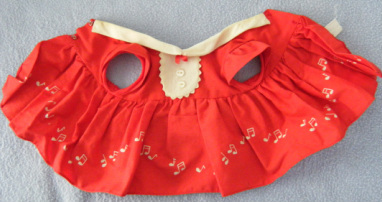 When we spread out the dress we noticed that it had musical notes all over the lower portion. Since the doll isn't musical we weren't sure what the connection was. Notice the toothless grin on her cute, but dirty, face. 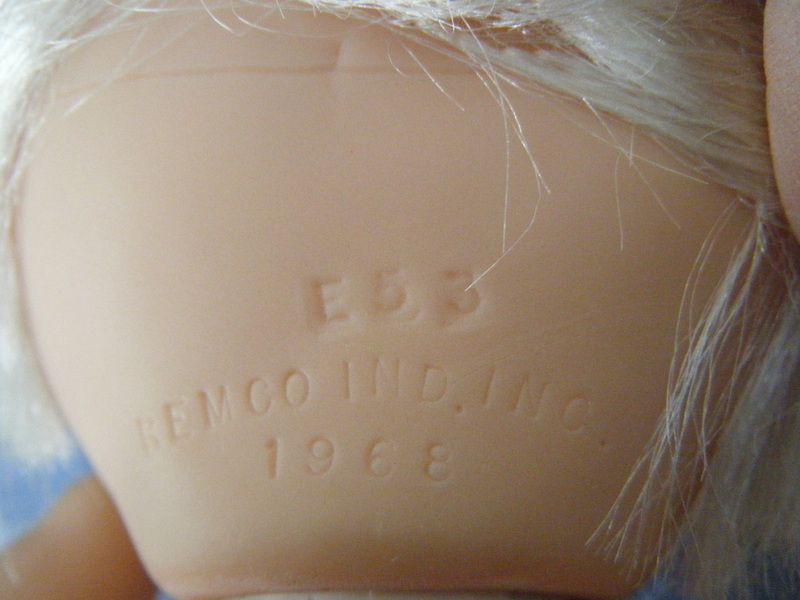 The manufacturing mark on the back of the head is nice and clear, "E53 REMCO IND. INC. 1968"
Notice the detail in the molded on shoes. The glue that joins the two halves of the legs and feet is often discolored from aging. Removing the doll's back revealed a complex mechanism. The reddish-brown discoloration is not battery corrosion (there are no batteries in the doll itself). It is hardened grease. The lower portion of the electromechanical system. Notice that red and green wires come from the legs where the battery provides current via the crib to heels path. 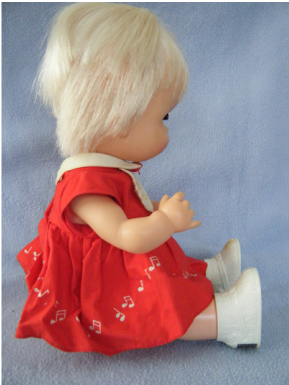 The right leg has a cam drive to make the doll sit up - the left leg just follows along. The middle section of the electromechanical system. The flailing arm movement is created by disks in oblong holes in the white fork. A key thing to notice is the white hole in the center. It does not have screw marks down its center but rather to the side. The screw was not set properly at the factory. This may have stressed, and ultimately cracked, the motor mount just to the left of the gray metal piece. A floppy motor would put stress on the gear train. 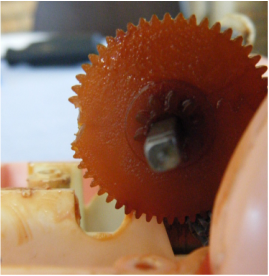 Once the broken gear was discovered, the teeth were easily located in the belly of the doll (stuck in place by hardened grease). Unfortunately, they are not replaceable. This doll will need replacement parts from another doll to work. Back view. She is having a bad hair day. She is also missing underwear. Since the doll didn't work when powered up we had to strip off her clothes to open her. When the dress was flipped over the mystery was solved. 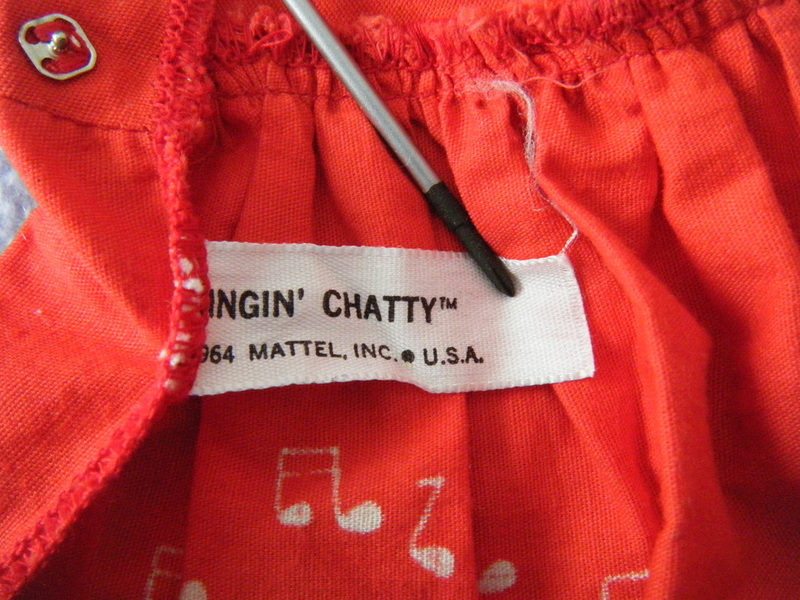 The Remco doll was wearing a Mattel dress for Singin' Chatty. Baby Grow-A-Tooth would have come in a red dress originally - but not this one! Her eyelashes are intact. The tooth is visible inside her mouth. The doll did not come with the pacifier or spoon but we were able to get the growing tooth to do its thing using the tip of a screwdriver. Since the doll was not functioning, she had to be opened. I like the dolls that are held together by screws. Bodies sealed with glue need to be cut open - a tricky process. 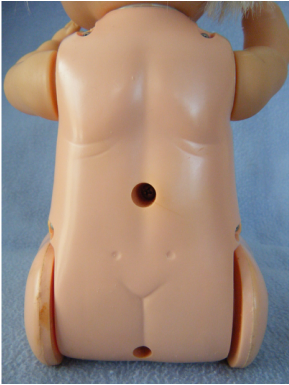 This doll has two shoulder screws, two hip screws, and a bottom screw. The large hole in the center of the back is also a screw hole. I believe this screw may be connected to the doll's mechanical problems. More on that to follow. The electrical contacts are embedded in the shoes. The magnets in the crib also grab the heels at these locations. The back of the doll reveals several interesting things. On the right hand side there is a vertical stripe of grease. When the mechanism was working properly the gears would have been spinning fairly fast and thrown off the grease - similar to an unfendered bike tire flipping up a trail of muddy water onto a rider. The other, critical, thing is the fragment of white plastic in the upper left portion. That comes from a broken motor mount! It must have happened a long time ago as it was stuck in place with hardened grease. The upper portion of the electromechanical system. Nothing connects to the head - the growing tooth is an independent subsystem. The arms have indexed notches so they can be repositioned by the user. 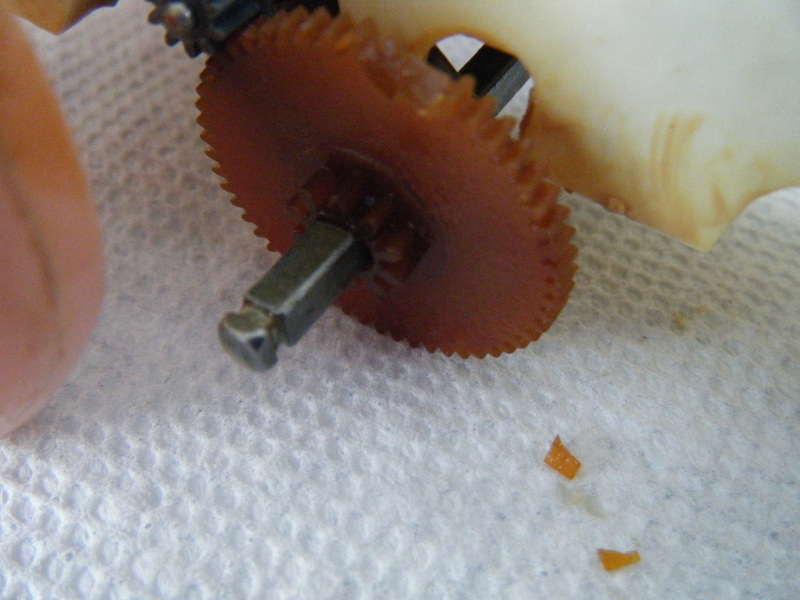 Yep - a broken drive gear, likely resulting from a flopping motor (from the broken motor mount). 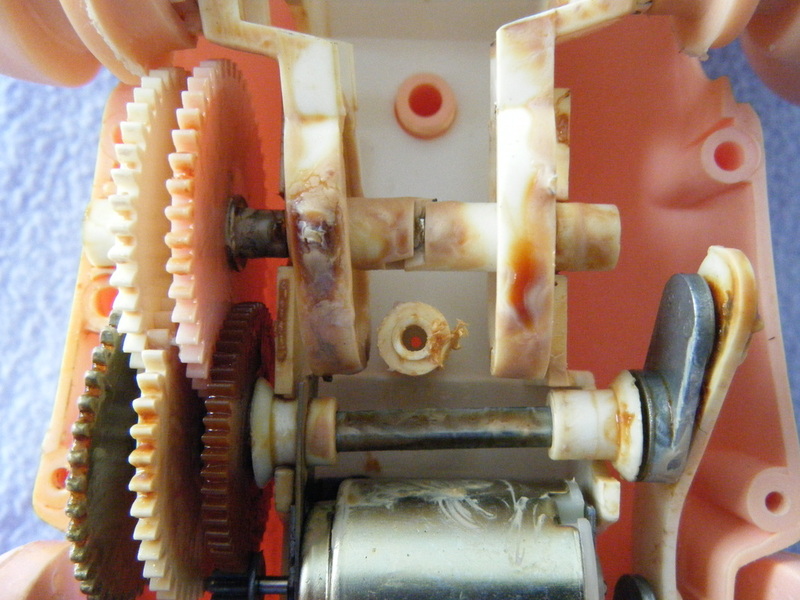 This gear is made from a different material from the other gears in the doll and is very brittle from age.